Preserving the wilderness within the city limits of Dallas, with possibly the largest urban bottomland hardwood forest in America, is part of the Trinity Watershed Management's environmental and recreational charter. 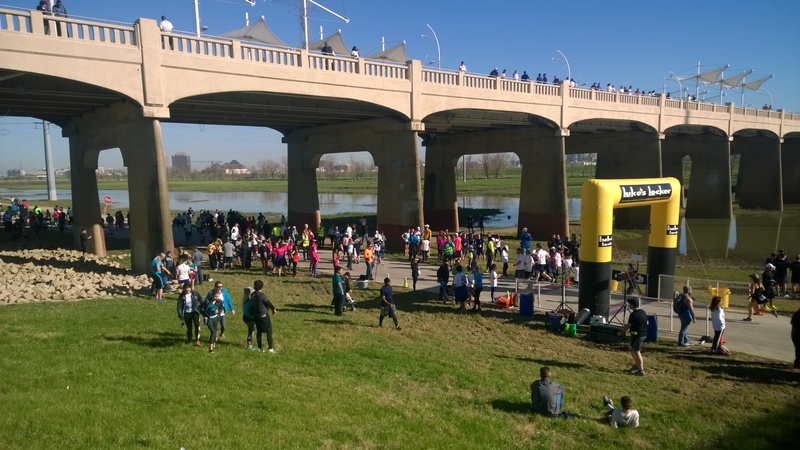 The boundaries of the forest extend from the Santa Fe Trestle Trail near Corinth Street and Riverfront Boulevard within view of downtown Dallas, to just past IH-20, an eleven-mile stretch of land that basically follows the Trinity River. Once the river leaves the forest, its course continues for another 450 miles down to the Gulf of Mexico. This long-overlooked environmental resource is now almost exclusively owned by the City of Dallas and the care and management of the land will rest with the City and the interest of its citizens. The Great Trinity Forest is home to groves of urban bottomland hardwood trees, rivaling New York City's Central Park in terms of size and recreational possibilities. Dallas' 6,000 acre Great Trinity Forest overshadows New York's 840 acre Central Park. What's that old saying? Everything is bigger in Texas! With the future addition of equestrian facilities, and the addition of whitewater, nature trails and multipurpose trails to be used for recreation and transportation, boat launches, and trailhead improvements; it should not only be said that everything is bigger in Texas but better, too! Each month, the forest flourishes with the vibrant colors from any given season punctuated with the grandeur of century-old "trophy trees," the whisper of windswept prairie grass, the rush of migratory water fowl overhead, and the voices of people walking forest trails at the Trinity River Audubon Center, Texas Horse Park, Lower Chain of Wetlands, William Blair Jr. Park and the Texas Buckeye Trail. Dallasites and visitors to the area are invited to experience the forest by hiking, biking and in some areas, horseback riding. 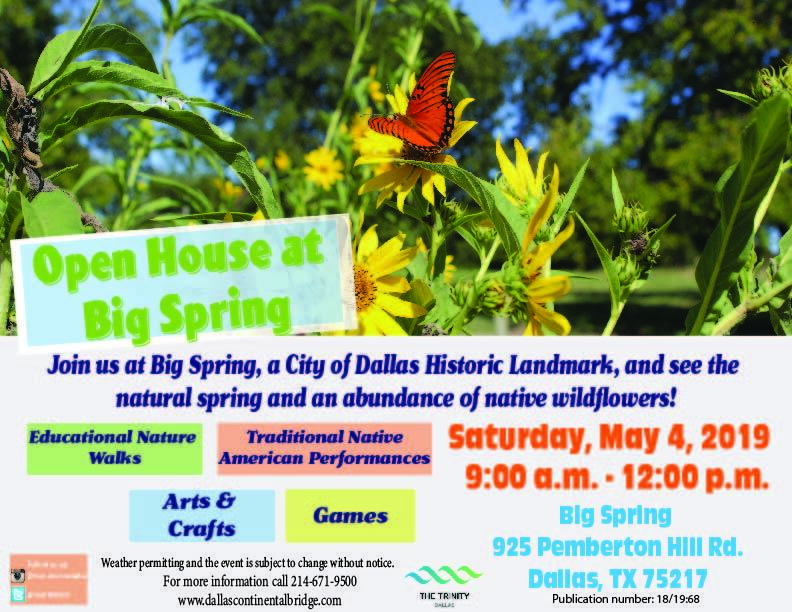 In 2016, Dallas Landmark Commission voted to name Big Spring an historic landmark for the City of Dallas. This is a first of its kind designation and the purpose of the designation is to help preserve this area for future generations. The City of Dallas, its federal partners and stakeholder groups such as the area Master Naturalists, work year around to preserve all aspects of this beautiful natural place in the Great Trinity Forest. In 2013, the City of Dallas requested the University of North Texas (UNT), with advice from the Lewisville Aquatic Ecosystem Research Facility (LAERF), a U.S. Army Corps of Engineers affiliate, develop, implement, and supervise a vegetation management plan for Big Spring. For this restorative natural spring setting, proposals and verified scientific restoration methods are followed, and these are practices are incorporated in the Dallas Floodway Extension Project and in the Great Trinity Forest Management Plan adopted by the then City Council in 2008. The Big Spring is open for visits and tours several times throughout the year. Individuals and groups may also request private tours, weather permitting by sending an e-mail to mytrinityriver@dallascityhall.com. ​Big Spring flowing natural spring and its variety of plants.